The most popular way to back a horse in the Grand National is the Each Way bet. It’s easy to understand why most people prefer this type of wager on the National, as the bet covers a horse finishing in any of the first four places. If you bet online with Betfair they’ll usually extend the finishing positions out to the first five places. The bet is made up of two parts: the ‘Win’ and the ‘Place’. Each part of the bet must be an equal stake, e.g. a £5 each way bet will have £5 on the ‘Win’ and £5 on the ‘Place’ making a total of £10. The ‘Win’ part of your bet is on your horse to finish first, and the ‘Place’ part is on your horse to finish either first or in one of the places, e.g. 2nd, 3rd, 4th (5th or 6th with selected bookmakers). If your horse comes home first (wins), both the ‘Win’ and ‘Place’ parts of your bet will pay out. But if your horse only places, you will lose the ‘Win’ part of your bet but you’ll still collect on the ‘Place’ 2nd, 3rd, 4th and 5th or 6th*. The amount won depends on number of factors. Most importantly, did your horse win the race, or was he just placed? and what odds did you get? Let’s assume your horse wins (1st) at 50/1 and you’ve backed him for £10 each way. The £5 ‘win’ portion of your bet pays out £250 (£5×50/1) plus the original £5 ‘win’ stake is returned, giving you £255, you’ll also get paid out on the ‘place’ part of the bet too! However, bookmakers will typically only pay out 1/4 of the quoted odds on ‘place’ portion of the bet. The £5 ‘place’ portion of your bet pays out £67.50. Worked out like this – a quarter of 50/1 is 12.5/1, £[email protected]/1 = £62.50 and your original £5 stake is returned, giving you £67.50. Add that to the £255 ‘win’ portion and you’ve got £322.50 in winnings. Now let’s assume your horse came third, bear in mind that it doesn’t make any difference to the payout if your horse finishes 2nd, 3rd or 4th . As your horse didn’t win, you lose the ‘win’ portion of the bet and £5. But you collect £67.50 on the ‘place’ portion of the wager. Worked out like this – a quarter of 50/1 is 12.5/1, £[email protected]/1 = £62.50 and your original £5 stake is returned, giving you £67.50. Where To Place The Bet? You can place an eachway bet at any high street bookmakers or do it online. However, you should be aware that not all bookmakers pay out to five or six places on the Grand National. Most bookies will only pay on the first four horses past the post and some bookies will only offer 1/5 the quoted odds rather than the standard 1/4. Want to learn how to place each way bets? click here. 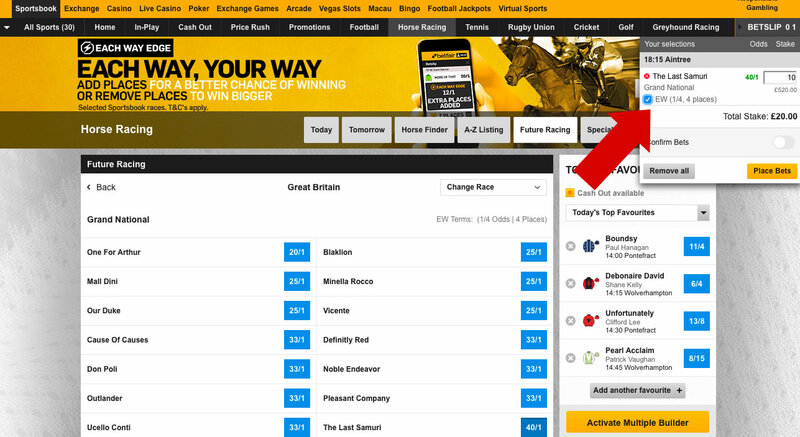 Below you can see an example of how to place an each way bet with online bookmaker Betfair. Most other online bookmakers work in a very similar fashion too. Select a horse by clicking on the odds box next to its name, a virtual betting slip will then open (usually on the right of the page) enter your stake and tick/check the box marked EW. Remember this will double your stake, so you may want to adjust it.